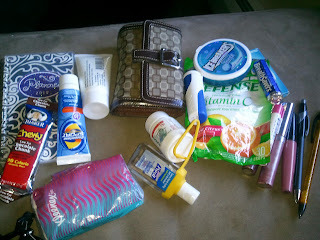 Its Always Something Around Here: What's in Your Bag? she was linking up to nicegirlnotes. So since I have been in a bit of a blogging slump lately I figure this might be a quick and fun post. Here's what is in my bag. The only thing not showing is my phone since I was using it to take the picture. It is a Samsung Fascinate. So there is wallet, lip glosses, soft lips, pen, pencil, tissue, ibuprofen, suntan lotion, lotion, granola bar, planner, mints, gum, rolaids. The other thing I just realized is missing is my MP3 player.....hmmmmm no idea where that is. Show us What's in Your Bag? Suntan lotion?? Time to put away the summer stuff and make room for Fall stuff! I don't carry a bag/purse. *gasp* LOL! believe it or not, i am with diana...i don't have a bag! i know, such a shocker for a girl but i just need my wallet and i am good to go. Stopping by from our SITS group. My purse is a mess. I don't think I'd want the world knowing what's in there! I can't show you my bag, because I don't carry a purse. If it doesn't fit in my pocket, I don't need it with me. I don't guess I have ever carried a purse (well my memory is a bit off, but as far back as I can remember anyway). Stopping by from SITS Billy-Goat Tribe! Here from the Monkey Tribe. I have a bag ... but it's a cheap one like all the other cheap-o ones before it and it becomes a mess in so many ways quite often. I need to just fork out the funds for a nice one, with decent space, functional compartments. Adding you to my RSS! See ya again soon! I am too ashamed to show my bag! I have just a bit of everything in there and every time I clean it out I wind up needing something that I threw away! Visiting from the monkey tribe. I have so much crap in mine that it would take all day just to list it all! I cleaned out my purse the other day and found wrenches in there. I wondered how many other women carry wrenches around in their purse... I've since put them back in the toolbox but I just had a good laugh over that one.